Our first stop on our three week anniversary adventure was Santiago, Chile, one of the most developed cities in South America. In addition to fighting its way into the spotlight, it is a culturally rich city full of energy and world class chefs creating new and delicious Chilean and Peruvian specialties. That was a huge surprise to us. But as much as we love exceptional food, we fell in love with the hearts of the Chilean people even more. It’s hard to describe the thoughtfulness and care we encountered wherever we went. From the moment we stepped off the plane, to our experience checking into our hotel, to even the wait staff in one of the city’s restaurants going out of his way to call us an Uber and then walk outside, up the stairs, and into the street with us, to make sure we connected with our driver…we were truly blown away. We only had three nights to spend in Santiago, but we’d like to return one day. What a wonderful city. We also visited Viña del Mar and Valparaiso while in Santiago, as well as the wine country, but more on those destinations later. After checking into the Ritz Carlton, our home for the next three nights, we met our guide Alberto for our first walking tour. 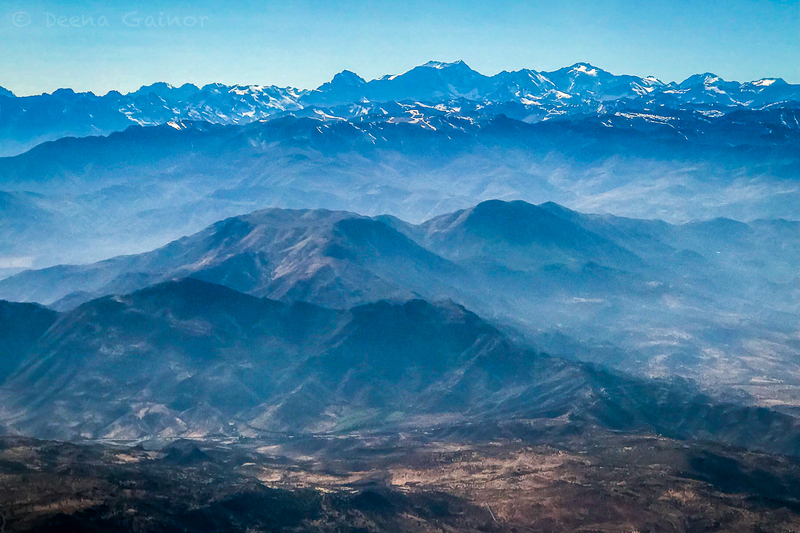 Here are a few photos from our time in Santiago. (Photos taken with iPhone 7 plus – no editing). First stop, Santa Lucia Castle Hill and a little jaunt into nature. The Pre-Columbian Museum with over 700 exhibits of pre-hispanic artwork and relics from diverse cultures including the Mayans, Aztecs and the Mapuches – from the south of Chile. The Fish Market – a very active, central meeting place where tons of vegetables, fruits, and fish are found. Be careful around the fish, though. The floors can be pretty slick. Dining Highlights: First photo – Colorful, aromatic Seafood Chilean Paella! The second photo is Pastel de Choclo. It’s like a hot soufflé with beef, chicken, and a hard boiled egg. Wow! And third – empanadas stuffed with beef and cheese. We also sampled some of the best salsas, ceviches, Pisco Sours, and wine. Did I mention Santiago is a fantastic choice as a destination if you’re a seafood or wine lover? More on that later. Hope you enjoyed our quick little jaunt. Okay, just not sure I can wait three years! Looks amazing, Deena!! Miss you! Thanks, Liza! Chile is really amazing. We loved it! Miss you too!! Heading here in late February! Can’t wait! Your photos are beautiful!! Thank you. Have a wonderful time! I imagine you will love it.